This map celebrates Rome's dedication to expanded public transit service and to creating a healthy and sustainable urban environment. Boston and Rome share a commitment to these goals and as both cities embark on expansion and improvement efforts for their transit systems, it was presented as a fitting gift from Boston's Mayor Walsh to Rome's Mayor Marino. It is the first transit map of Rome that depicts all of the city's rail modes from trams up to regional rail and as such provides visitors and residents with the most clear and complete image ever created of how to move around one of the world's greatest cities. Furthermore, it depicts the soon to be opened C Line of the Metro system as well as future plans for the extension of the C.
By simplifying the representation of the Regional Rail lines (ferrovie regionale) I created more space on the map and a much clearer depiction of the system's many interwoven routes. This also allowed for greater definition of the Leonardo Express, the nonstop train from central Rome to the City's main airport. 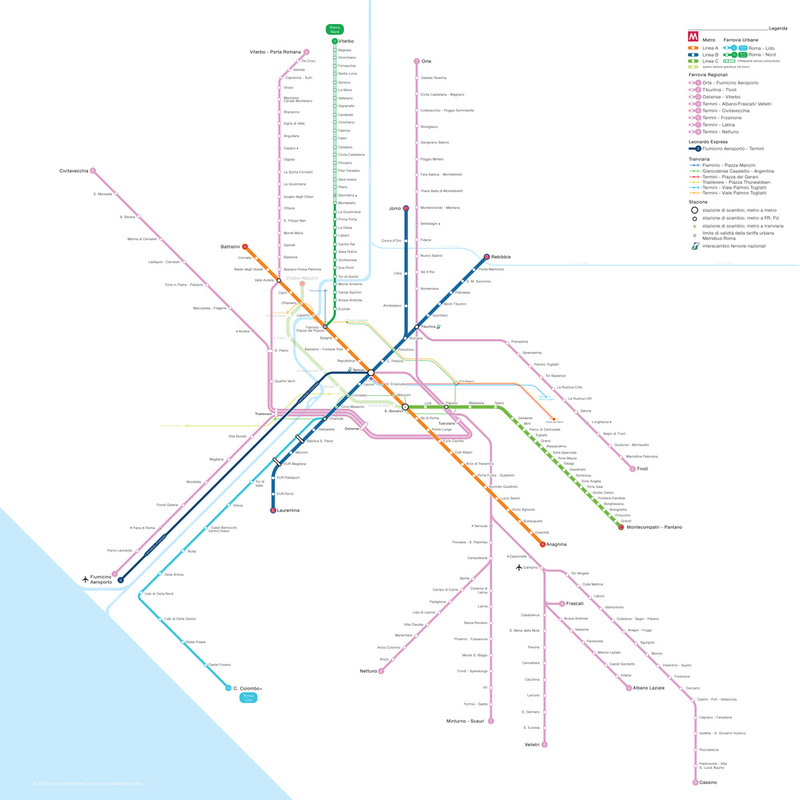 Perhaps most uniquely, this map introduces the city's tram lines (tranviaria), and though it doesn't show every stop on them, it does show how they connect to the other transit modes as well as transfers between each other, resulting in the most comprehensive system map possible. I would like to dedicate this map to the Italian Modernist graphic designer, Massimo Vignelli who passed away May 27, 2014 while I was designing the map and whose work continues to be an inspiration to me.